1. Army-PSU to “the U”: Army West Point’s Oct. 3 visit to Happy Valley to battle Penn State now has a time (noon Eastern) and a TV home (ESPNU). It already had a packed house: Penn State announced a sellout for Beaver Stadium, including more than 6,500 seats donated to service members, on Sept. 9. Army has lost its first three games by a combined 10 points and will visit Eastern Michigan this Saturday (6 p.m. Eastern, ESPN3) before heading to Happy Valley. Penn State sits at 2-1 and will host San Diego State on Saturday for what will be the third of five straight PSU home games. 2. 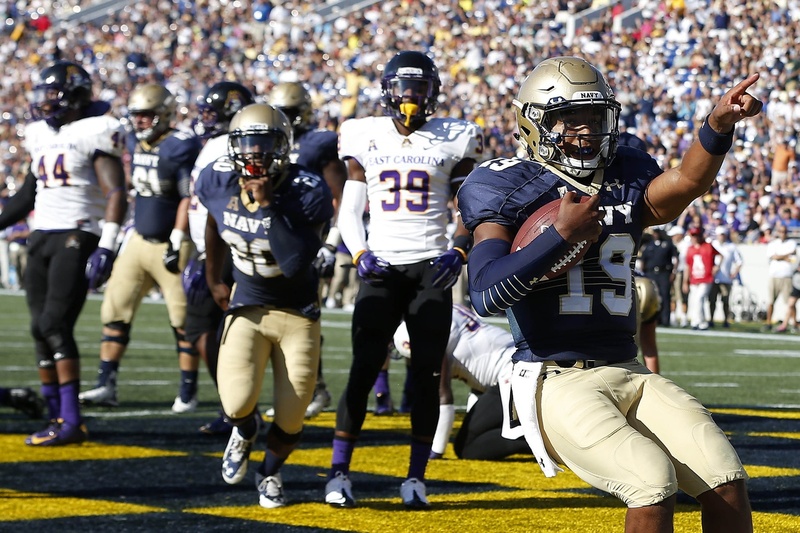 Reynolds is All-‘American’: An easy call for the American Athletic Conference staffers in charge of picking the league’s best offensive player from over the weekend, as Navy quarterback Keenan Reynolds racked up five rushing touchdowns in a 45-31 win over East Carolina. The Navy senior now has 70 rushing TDs on his career; Wisconsin’s Montee Ball holds the all-time college record at 77. 3. Top of the charts: Reynolds’ effort helped the Midshipmen rattle off a handful of program firsts on Saturday, including a win in Navy’s first-ever conference game and a first-ever spot atop a division. In fairness to the rest of the AAC West, no other schools in the division have played a conference game yet (ECU is in the AAC East). The first conference road game in school history comes Saturday against Connecticut (noon Eastern, CBS Sports Network). 4. Spartan pride: Air Force also sits atop the standings, 1-0 in the Mountain West Conference’s Mountain Division thanks to a win over San Jose State in Week 2. However, Saturday’s 35-21 loss to Michigan State may do more to raise the Falcons’ profile than any MWC contests — the Spartans now rank second in the nation, behind Ohio State, and were favored to demolish the Falcons by more than three touchdowns. That looked like a good bet with Air Force down 35-7 in the third quarter, but the Falcons found some late offensive success despite the absence of quarterback Nate Romine, out for the season with a knee injury suffered in the win over SJSU. Air Force is off this weekend before visiting Navy on Oct. 3 (3:30 p.m. Eastern, CBS Sports Network). 5. Army-Navy update: The basketball doubleheader between the Black Knights and Midshipmen set for Madison Square Garden has an official TV home for those who can’t make the trip to New York City. CBS Sports Network will air both ends of the Jan. 23 twin bill: Army-Navy women at 11:30 a.m., Army-Navy men at 2 p.m., according to a Monday announcement from the Patriot League. The Feb. 20 Army-Navy doubleheader at Annapolis also will air live on the network, which begins its Patriot League slate Nov. 13 when Florida visits Navy for the Mids’ nonleague season-opener.